Ritsako Game lodge management and its staff welcome you to the exciting and customer focused Game Lodging. This luxurious lodge offers a bush safari for both international tourist, business activities and casual travellers. You will witness the experience of a bushy life in friendly and warm yet adventurer’s environment. You do not have to tour the Reserve in order to witness the wild life-it is right next to your door step as you enjoy a cup of coffee or a cold beer. You can almost feel and touch these animals. Yes, the BIG FIVE can be viewed around the secured electrified fence. You have now found a luxurious, peaceful, relaxing lodge where you can rest and forget about work. Ritsako Game Lodge is a newly and luxuriously constructed Lodge that offers piece of mind for your holiday experience. The Lodge is situated 45km North of Pretoria on the N1 highway road. The drive from the airport is only 1,5 hours as well as from the Johannesburg area. The Lodge offers 19 luxurious fully catered units which overlook a private swimming pool and a well-designed viewing deck from where one can witness wild animals congregating on a small river during sunrise and sunset. 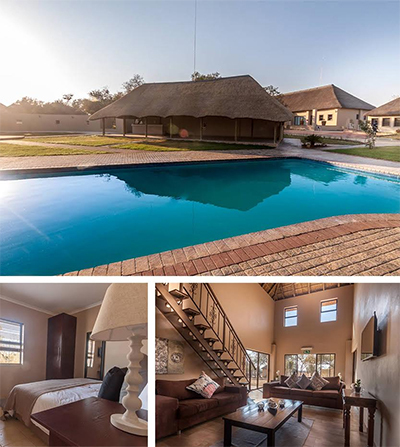 In addition, the lodge has self-catering apartments which offer several options for couples, corporates, families or groups to suit individual needs. Self-catering suites with two luxurious rooms each are also available. Ritsako Guest lodge management and its staff welcome you to the exciting and customer focused Game Lodging. This luxurious lodge offers a bush safari for both international tourist, business activities and casual travellers. You will witness the experience of a bushy life in friendly and warm yet adventurer’s environment. You do not have to tour the Reserve in order to witness the wild life-it is right next to your door step as you enjoy a cup of coffee or a cold beer. You can almost feel and touch these animals. Yes, the BIG FIVE can be viewed around the secured electrified fence. You have now found a luxurious, peaceful, relaxing lodge where you can rest and forget about work. 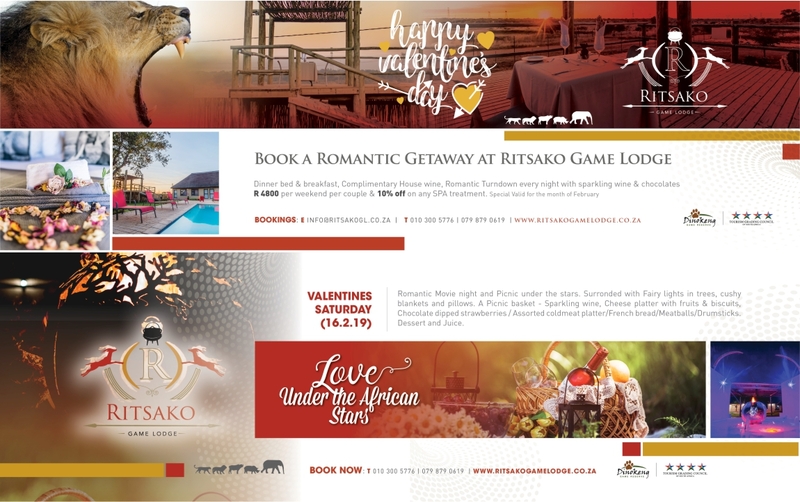 Ristako Game Lodge is a newly and luxuriously constructed Lodge that offers piece of mind for your holiday experience. The Lodge is situated 45km North of Pretoria on the N1 highway road. The drive from the airport is only 1,5 hours as well as from the Johannesburg area. The Lodge offers 19 luxury suites overlooking a private swimming pool, a well designed viewing deck specifically to witness the wild animals congregating on a small river in the early morning and during sunset. Self-catering apartments offer preferences for couples, corporates, families or groups for their convenience.